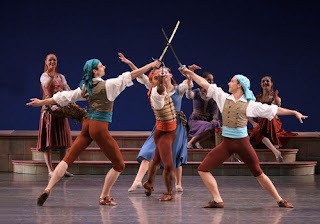 Pacific Northwest Ballet School’s new production of “Le Corsaire: A Pirate’s Tale” turns a 19th century popular ballet into an 80-minute swashbuckler for younger fans. PNB’s education programs manager Doug Fullington reconstructed and staged “Le Corsaire” using dance notation from St. Petersburg, Russia, which represents Marius Petipa’s 1899 version of the ballet. Fullington also recently discovered the 1857 notation from Lyon, France, likely based on original version of the ballet danced in Paris that same year. "Based on Byron’s poem, very loosely, it had its initial run in Paris in 1856/57 and went to Russia right away, where it was hugely popular," he said. “I first worked with “Corsaire” when I got asked to go to Munich and help revive dances for Bavarian State Ballet. We’d done a little bit of it here in 2004, “Le Jardin Animé” (the enchanted garden sequence) for a school performance. They had read about it and that’s how I got that call,” said Fullington, a fluent reader of the Stepanov dance notation system that was used by the Imperial Theatres in St. Petersburg between 1885 and 1915. By the end of his time in Munich, Fullington had reconstructed 25 dances from Russian choreographer Marius Petipa’s “Le Corsaire” for the Bavarian State Ballet. This version was presented in 2007. “I always thought it might work as a streamlined, one-act ballet. Then, at some point, Peter (Boal, PNB’s artistic director) and I talked about it being a ballet for students. I put it together in three scenes or about an hour of dancing. We present it with a short intermission for a full experience for the kids who come see it,” he said. “In this presentation, we’re using about 140 students” in first two performances March 20 and the final performance on Saturday, March 26. “The scene shop made beautiful scenery and the costume shop really got into it. Designer Charlene Hall has done great research about the whole exotic locale used in the ballet, so it is a lovely setting,” he said. For the students of PNB School, the humor of the ballet gives them plenty of opportunity for fun too. The ages of the dancers in this production ranges from around 8 or 9 all the way up to 19, according to Fullington. “I’m staging the dances the same way that I would if they were a professional company. And they’re having a good time. A lot is asked of them. Lots of character dances and pantomime.” Almost every dance uses props, whether fans, swords, or pistols. “Coins are thrown in the air, garlands, baskets of roses. The plot is very melodramatic and it was fun for the kids. It’s your typical pirate fare. Lots of comedy thrown in. Ballet at the time was the lighter of the art forms,” said Fullington. The Seattle Youth Symphony accompanies the ballet, using the 1856 Parisian score by Adolphe Adam with additional music by Cesare Pugni and Léo Delibes. “We used as much of the original French score as we can,” said Fullington. “The music is great.” Narrator Tim Hyland helps the smallest audience members keep up with the action.